Great News for USA customers! 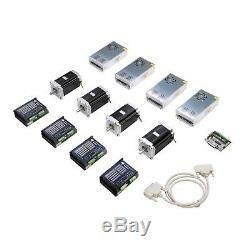 4 pcs Stepper Driver DM860A Up to7.8A, 24-80VDC, DM860A. 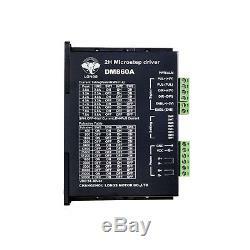 DM860A is a type of two-phase hybrid stepping motor driver, The drive voltage of which is from 24VDC to 80VDC. It is designed for use with 2-phase hybrid stepper motor of all kinds with 57mm to 110mm outside diameter and less than 8.0A phase current. This circuit that it adopts is similar to the circuit of servo control which enables the motor run smoothly almost without noise and vibration. Hording torque when DM860A run under high speed is also significantly higher than the other two-phase driver, whats more, the positioning accuracy is also higher. It is widely used in middle and big size numerical control devices such as curving machine, CNC machine, and computer embroider machine, packing machines and so on. L High performance, low price. L Average current control, 2-phase sinusoidal output current drive. L Supply voltage from 24VDC to 80VDC. L Overvoltage, under voltage, overcorrect, phase short circuit protection. L 14 channels subdivision and automatic idle-current reduction. L 8 channels output phase current setting. L Offline command input terminal. L Motor torque is related with speed, but not related with step/revolution. L High hording torque under high speed. Pulse signal, PUL+ is the positive end of pulses input pin. PUL- is the negative end of pulse input pin. DIR signal: DIR+ is the positive end of direction input pin. DIR- is the negative end of direction input pin. Enable signal: ENBL+ is the positive end of direction input pin. This signal is used for enabling/disabling the driver. High level for enabling the driver and low level for disabling the driver. ENBL- is the negative end of direction input pin. PCs control signals can be active in high and low electrical level. When the high electrical level is active. All control negative signals will be connected together to GND. When low electrical level is active, all. Control positive signals will be connected together to public port. Now give two examples Open collector. Input port circuit (Yang connection). R must connect in the control signal part. Function choice (Using DIP pins to achieve this function). 1 Micro step resolution is set by SW 5,6,7,8 of the DIP switch as shown in the following table. SW4 is used for this purpose. OFF meaning that the standstill current is set to be half of the selected dynamic. Current and ON meaning that standstill is set to be the same as the selected dynamic current. The first three bits (SW 1, 2, 3)of the DIP switch are used to set the dynamic current. Closest to your motors required current. Semi-flow function is that there is not step pulse after200 ms, the driver output current automatically. Reduced to 40% of rated output current, which is used to prevent motor heat. Pins of motor & power. The peak input current can not up to 6A. 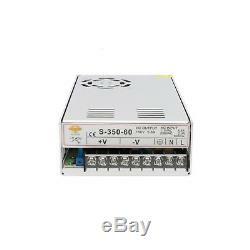 The power is 350W, the output voltage is 60VDC. Built in DB25 male connector. DB25 Output Pin:P1, P2, P3, P4, P5, P6, P7, P8, P9, P14, P16, P17. DB25 Input Pin: P10, P11, P12, P13, P15. High quality with Surface-mount Tech. 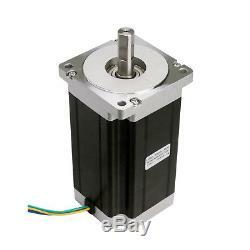 The item "4Axis Nema 34 Stepper Motor 1600oz & Driver CNC Router/Mill longs stepper motor" is in sale since Monday, March 19, 2012. 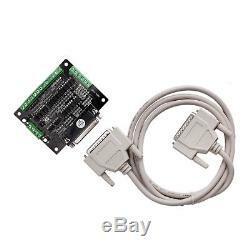 This item is in the category "Business & Industrial\Automation, Motors & Drives\Drives & Starters\Drives & Motor Controls\Stepper Controls & Drives". The seller is "longs_motor" and is located in industry. This item can be shipped to United States, all countries in Europe, Japan.